I like to take pictures of animals, but I need them to be asleep to get a quality photo. That’s why I’m so impressed with the images below from the National Wildlife Photo Contest. These photographers were able to capture brilliant photos of wildlife in action. Think about it: they flutter, run, dance, fly, the list could go on forever. I hope you dig this sampling of all the ways animals move. What would you add to the list? Most sharks move their tail back and forth to propel themselves forward. This tiger shark was photographed off the coast of North Carolina by National Wildlife Photo Contest entrant Jeremy Kozman. Grizzly bear creates quite a splash while trying to catch salmon in Alaska. Photo by National Wildlife Photo Contest entrant Tommaso Balestrini. Cheetahs can sprint at speeds of up to 70 m.p.h. while a wildebeest runs at 50 m.p.h. Photo by National Wildlife Photo Contest entrant Sanjay Hiraskar. 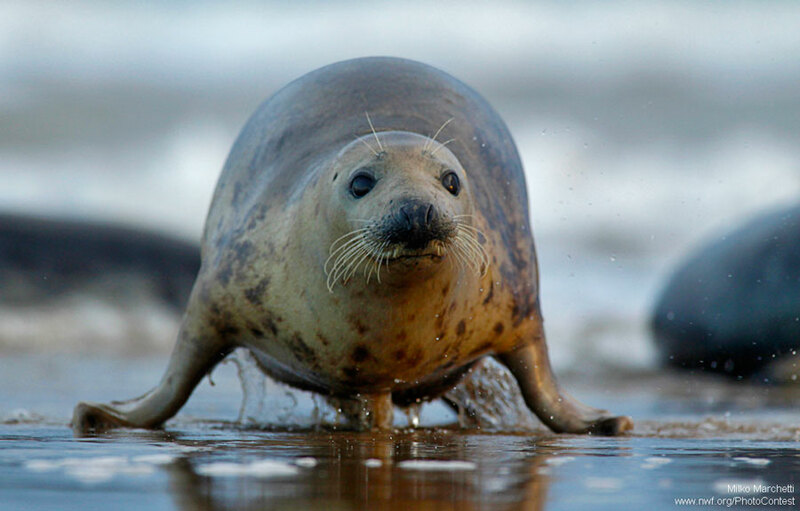 Seals have small flippers that make it difficult to move on land. Photo by National Wildlife Photo Contest entrant Milko Marchetti. Red foxes pounce with incredible precision. This fox kit was photographed in Massachusetts by National Wildlife Photo Contest entrant Sandy Selesky. Blue banded bees have a dart and hover flight pattern. This one was photographed hovering in India by National Wildlife Photo Contest entrant Joshi Bhavya. Turtle in New Jersey, by National Wildlife Photo Contest entrant Mike Quinn. Frog leaps in India, by National Wildlife Photo Contest entrant Satpal Singh. Bighorn sheep butting heads. Photo by National Wildlife Photo Contest entrant Daryl Hunter. Mountain goats jump in Colorado. Photo by National Wildlife Photo Contest entrant Cathy and Gordon Illg. Believe it or not, this is a fight, likely related to nesting or feeding territory. Great egrets apparently can’t help but be graceful. Photographed in California by National Wildlife Photo Contest entrant Thomas Anderson. Dabbling ducks tip their bottoms up in the air while they feed. They submerge their heads in shallow water and probe the bottom for aquatic organisms (vegetation, fish, invertebrates, etc). These ducks were photographed in Pennsylvania by National Wildlife Photo Contest entrant Donald Madson. Gentoo penguin slides on the Antarctic Peninsula. Photo by National Wildlife Photo Contest entrant Brian Kamprath. Fruit bat hangs in Kenya. Photo by National Wildlife Photo Contest entrant Jenna Parker. Snake slithers in Maryland. Photo by National Wildlife Photo Contest entrant Hannah Grove. Bears cubs wrestle and play in Alaska. Photo by National Wildlife Photo Contest entrant Ursula Dubrick. Photograph by National Wildlife Photo Contest entrant Amir Ayalon in North Israel. 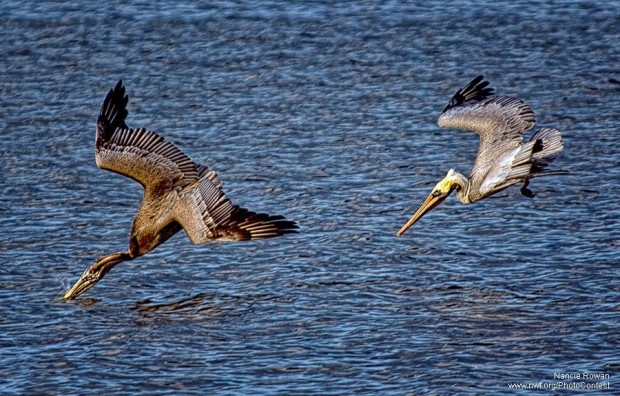 Pelicans diving into water in Florida, photographed by National Wildlife Photo Contest entrant Nancie Rowan. Bear cub climbing in a tree. Photo by National Wildlife Photo Contest entrant Barrett Hedges. Giant petrel playing in the surf. 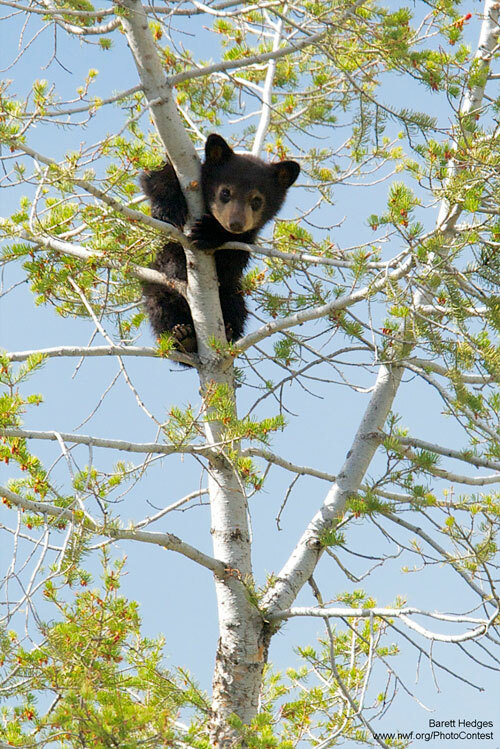 Photo by National Wildlife Photo Contest entrant Isobel Wayrick. Sometimes after all that action, it’s time to just relax. Raccoon stretched out to relax in Washington. Photo by National Wildlife Photo Contest entrant Nancy Martin. If you’d like to see more wildlife and nature pictures, check out the National Wildlife Photo Contest. And if you’re a nature photographer, enter to win great prizes, like a trip to photograph polar bears and a chance to have your pictures in National Wildlife Magazine.